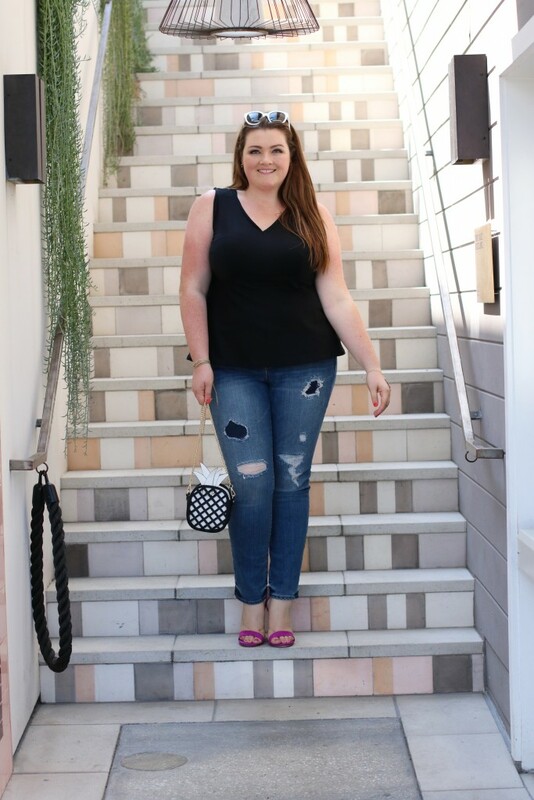 Yes, you heard me Stitch Fix is now carrying Plus Sizes! I’ve partnered up with them to offer some of my favorite styling tips as I explore the service. I just got my first fix and the whole process is super easy. Just fill out the style survey about what you’re looking for and you can also leave notes for your stylist to help curate your box even more. Stitch Fix is perfect for those of you looking for an easy way to be styled without having to think about it! I just got my first fix and I am going to share a few of my favorite pieces with you that I opted to keep! First up my box included a pair of jeans from Slink in the Joby Wash (those of you who know me know that they are one of my favorite brands of denim), two tops, a cardigan and earrings. I decided that my favorite pieces were the denim and the black sleeveless peplum top. One of the things I am always on the hunt for are great tops and this always seems to be the hardest thing for me to find! Since the weather in LA tends to be warmer in the day but cooler at night, something like this Lovapella peplum tank top is perfect because I can easily layer it and throw on a jacket for the evening. Normally when I wear colors like black or white, I love to make sure I have fun accessories with a pop of color. I opted to style this look with my purple heels to give it that fun edge but also not gonna lie, heels elongate my legs in jeans and I am all for that. Another thing to note too, is that this pair of jeans are skinnies which also make me look taller and slimmer I also paired the look with this cute pineapple purse just because… conversation starter. So there you have it, my first experience with Stitch Fix was a great one and I am looking forward to my next FIX!!! This post is part of an ongoing partnership with Stitch Fix as always all opinions are my own. Wow, that’s pretty! Love the V-neck black top with a flared look and ripped slim jeans. Simple and very practical. Love the pineapple clutch bag! Thank you, I love the bag too!! hello there,ciao…what a fabolous look of yours…cheers! Ohhhh love that they have plus size!!!! You look fantastic, I love everything that you are wearing! So I stumbled upon your poshmark shop which had me thinking I need to see this blog! So glad I did! Your style is so on point! This look is so great! I absolutely Love peplum!